On 16 November 1907, Oklahoma Territory and Indian Territory were joined to become the new State of Oklahoma. Ezekiel Lafayette Alexander submitted his final account of the settlement of the estate of Edgar Daniel Wilbanks to the Probate Court of Pottawattamie County, State of Oklahoma in March 1908. The report was approved by Judge E. D. Reasor on 18 March. Tribbey & Tribbey, a local drug store, for prescribed medication (including brandy, $1.00) totaling $9.75 ($261.08 in 2019 dollars). Dr. S. D. Dodson, for medical treatment (two visits at $2.50 each and two prescriptions at 50¢ each) totaling $6.00 ($160.67 today). Dr. Dodson came from Sacred Heart, the nearby Roman Catholic mission and school. Ogee, Tinkle & Disch, for two coffins and burial, $42.50 ($1,138.06 today). The total owed to all creditors was $411.33 ($11,014.54). Section two detailed the items of receipt and disbursement – income received from the sale of property and payments made to creditors. Among the items sold, “one spotted cow branded A.R.K. on left hip worth $22; one Roan cow, branded A.R.K. on left hip worth $22.” The total income received was $962.40 ($25,771.02). After paying out $411.33 ($11,014.54) to creditors, the balance on hand was $551.07 ($14,756.48). Margaret Wilbanks married Butler Thomas Howell in Searcy County, Arkansas on 1 May 1904. They were living in Stanley, Pushmataha County, Oklahoma in 1908, some 85 miles southeast of Maud as the crow flies. John Wilbanks married Rosetta Bohannon in Searcy County, Arkansas on 5 February 1899. In 1908, they were living in Stanley, Oklahoma. James, Rueben and Bert Wilbanks were minors under the guardianship of Ezekiel Lafayette Alexander, the administrator of Edgar Wilbanks’ estate. They were living in Stanley, Oklahoma, probably with their older brother John. Jody Wilbanks married Giles Turney in Searcy County, Arkansas on 14 February 1901. They were living in Bear Creek, Searcy County, Arkansas. Nettie, Talmage and Dewey Treadwell were the minor children of Andrew Jackson Treadwell and the late Louisa Wilbanks. They were living with their father and his second wife Florida J. Watts in Bear Creek, Searcy County, Arkansas. Pearl and Loy Bohannon were the minor children of Patrick Bohannon and the late Mary Wilbanks. They were living with their father and his third wife Mary Graham in Bear Creek, Searcy County, Arkansas. Patrick also was an uncle to John Wilbanks’ wife Rosetta. Silas Bradley was the adult son of William Titus Bradley and the late Sarah J. Wilbanks. In 1908, he resided in Waxahachie, Ellis County, Texas. With his report approved by the court, Ezekiel Alexander again placed notices in the Maud Monitor thrice from 20 March through 17 April declaring that the final settlement of the Wilbanks estate would occur on 20 April 1908. There were no objections brought before the Probate Court on the twentieth, so Judge Reasor declared the estate settled and issued his Decree of Distribution. Although the decree indicated the same total balance to be distributed that Alexander’s account had, $551.07, the shares due each heir were lower than what Alexander had determined, and when added together, did not equal $551.07. The mistake was not noticed. The Wilbanks heirs would receive $12.15 ($325.35 today) less than they should. On 29 May 1908, the court issued checks to Patrick Bohannon in the incorrect amount of $29.94 each. 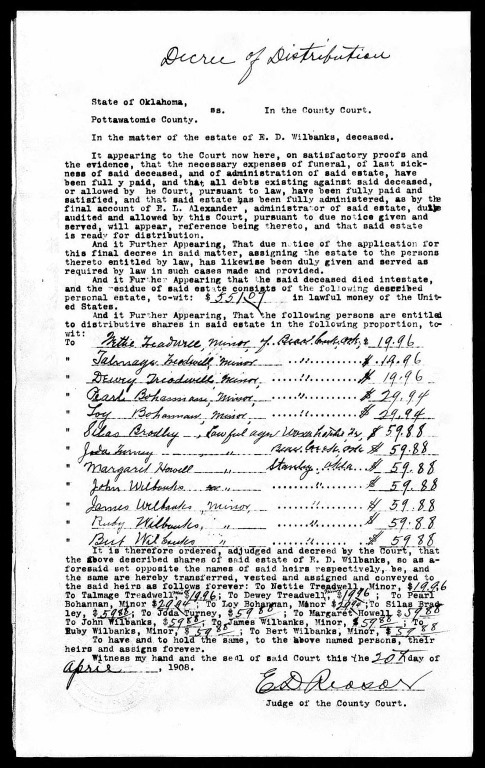 William T. Mills, a lawyer from Marshall, Arkansas, sent a letter dated 7 September 1909 to the court reporting that the Treadwell heirs had received a check totaling $38.58, an amount which didn’t match Alexander’s report nor Judge Reasor’s decree. That same letter referred to the estate of “S. F. Wilbanks.” Perhaps the Treadwells would have benefitted from a better lawyer. No other payment vouchers for the heirs were found in the probate records. Find A Grave, memorial page for Arthur William Tribbey, Memorial no. 145653468. Donna Stacy, “St. Louis,” The Encyclopedia of Oklahoma History and Culture, https://www.okhistory.org/publications/enc/entry.php?entry=ST008. “1907 dollars in 2019 | Inflation Calculator.” U.S. Official Inflation Data, Alioth Finance, 3 Mar. 2019, https://www.officialdata.org/1907-dollars-in-2019.